Though more and more European countries are getting prudent, or divided, on their alliance with the US after President Donald Trump took office with controversial policy shifts, Poland seems less hesitant in following its ally's strategy. The question is: should China be worried about Warsaw joining Washington's containment of Beijing? The latest event to be held by Poland and the US is a global conference scheduled in Warsaw on February 13 and 14 to focus on Iran's influence in the Middle East. The event comes amid rising tensions between Washington and Tehran after the Trump administration reviewed the US policy on Iran and withdrew from the Iran nuclear deal that has caused international controversy. The conference, dubbed by international media an "anti-Iran" event, was blasted by Tehran. Iranian Foreign Minister Mohammad Javad Zarif criticized the Polish government for agreeing to host the conference, reminding Warsaw of thousands of Polish refugees saved by Iran during the World War II. "Polish Govt can't wash the shame: while Iran saved Poles in WWII, it now hosts desperate anti-Iran circus," Iranian Foreign Minister Javad Zarif tweeted on Friday. Poland put itself at the center of international attention by proposing a permanent US military base on its territory, and it will reportedly pay the $2 billion cost and name the base "Fort Trump." Despite being called a "dangerous and delusional" deal, Poland's proposal seemed to proceed smoothly as relevant talks are "going well," the Washington Post reported in December. With some 3,000 US troops on a rotating basis in Poland, Warsaw is eyeing a shield against a more aggressive Russia and also a bigger say among European countries with the base, Chinese analysts said. "Security has always been the top priority for Poland and it is understandable that Warsaw is holding Washington tight with this concern. However, Poland needs to weigh the consequences of such moves," Liu Zuokui, a research fellow on European studies at the Chinese Academy of Social Sciences in Beijing, told the Global Times. Zhang Shengjun, an international politics professor at Beijing Normal University, told the Global Times, "Poland will make itself a direct target of Russia. It could be the first victim of the military base, if Russia takes a tougher move." Poland's high-profile move to follow the US, an ally since the Cold War era, has also made some Chinese worry about how much autonomy Poland has in its policy toward China, and more importantly, if Beijing will be its next target as the US is currently believed to be positioning China as its No.1 rival. The question surfaced after Poland arrested a Chinese businessman, a former employee of China's telecommunication giant Huawei, on espionage allegations. Poland also announced it was considering banning Huawei products in public bodies over security concerns, Reuters reported on Sunday. Poland's internal affairs minister, Joachim Brudzinski, also called for the European Union and North Atlantic Treaty Organization (NATO) to work on a joint position over whether to exclude Huawei from their markets, said the report. The move was regarded as Poland joining the US in pressing its NATO allies to coordinate efforts to address security challenges from China, the Wall Street Journal reported on Sunday. China dismissed the security threat narrative on Monday, demanding "solid evidence" and relevant countries to stop the "groundless rumors" and "unfair scrutiny" of Chinese companies. Facing the allegations, Huawei stressed that its operations in Poland are in accordance with law. "It's reasonable that China will worry whether Poland, a hard-core US ally, will rush to the front in supporting the US strategy to contain China, but it's still too early to tell whether the Huawei case is just a beginning and how far Warsaw will go down that path," said Liu. Meanwhile, analysts noted that Huawei's investment in Poland could have been an example for China-Poland cooperation as more and more Chinese investors are eyeing the competitive market in the heart of Europe, but the high-profile move by Warsaw at such a sensitive time is chilling the enthusiasm of Chinese investors. "Poland may have no choice in siding with the US against Russia due to historical and security concerns, but it does have a choice of whether and how much to side with the US to contain China," said Zhang. "There's no reason for Poland to damage ties with China. Though Poland has a stronger hostility toward socialism among central and eastern European countries, it has neither historical grudges nor geopolitical conflicts with China, and Poland needs China for its future development," said Zhang. At the daily briefing on Monday, Chinese Ministry of Foreign Affairs spokesperson Hua Chunying stressed that China values its relations with Poland and sound and stable bilateral ties fit the interests of both sides. China hopes Poland can do more things beneficial to political trust and cooperation, said Hua. During Chinese President Xi Jinping's state visit to Poland in 2016, the two countries lifted ties to a comprehensive strategic partnership. Chinese brands are not strange to Polish people. 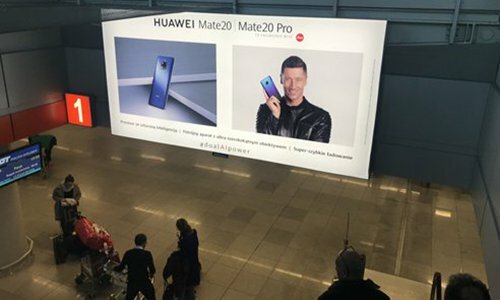 Giant billboards of Huawei usually occupy the most eye-catching spots in the country, such as the Warsaw Chopin Airport and main junction in downtown Krakow. At the Galleria mall at center of Katowice, Poland's southern mine city, Xiaomi, DJI and Miniso stores stand beside each other. Huawei and Xiaomi are the two most popular smart phone producers in Poland, a Krakow taxi driver told the Global Times reporter on a visit to Poland in December. Chinese restaurants are also popular in the city, he told the reporter, and a hot pot restaurant was recently opened. Poland has also been an enthusiastic supporter of the China-proposed Belt and Road initiative (BRI), compared to the more cautious welcome by other European countries. Cooperation is improving under the BRI and 16+1 cooperation framework. At the end of 2015, China and Poland signed a memorandum of understanding on BRI. From 2012 to 2017, China-Poland trade has grown at an annual rate of 8 percent. By October 2018, bilateral trade reached $20.1 billion, a 17.4 percent year-on-year increase, Liu Guangyuan, the Chinese Ambassador to Poland, told the Global Times in an interview in December 2018. China is the second-largest source of imports for Poland, according to China's Ministry of Commerce website. China's space lab Tiangong-2, launched in 2016, carries a gamma ray polarization detector jointly developed by scientists from China, Switzerland and Poland. In September 2018, TCL, a Chinese electronics giant and also the world's third-largest manufacturer of television, opened a R&D center in Poland. The center will mainly focus on artificial intelligence (AI) and their projects will include speech recognition and image analysis to be later used in smartphones, TVs, refrigerators and dishwashers, local industry information website Poland In reported in September. The bilateral cooperation in business, trade and agriculture has been booming, said Liu, and the two markets need each other and see a huge potential for exchanges. The tendency is unlikely to be stopped by political reasons, he said. Newspaper headline: Should China worry if Poland woos the US?